To search for a term on this page, simply click CTRL+F (on a PC) or COMMAND+F (on a Mac) to search this page. A result or condition presupposed by experience or conceived beforehand. Renowned tenth-century Jewish copyist and scribe who refined the Tiberian system of positioning vowel sounds in Hebrew biblical texts. A tenth-century bound Hebrew Bible scribed in the Ben-Asher Masoretic tradition. This codex was once believed to be the oldest complete Hebrew Tanakh, but it now is missing its Torah section. Alfonso X of Castile (November 23, 1221–April 4, 1284) was a thirteenth-century Spanish king who engaged Jewish, Muslim, and Christian scholars to translate and copy important literary works, especially the Hebrew and Greek biblical texts, into his native language. He was the author of Cantigas de Santa Maria. It’s believed King Alfonso, known as the Marian Monarch, built the first church of Our Lady of Rocío after the conquest of Niebla in 1262. Tradition holds that “Alfonso the Wise” had the statue of the Virgin placed in the chapel at this time. Literally “to uncover” or “reveal.” Hence the apostle John’s book of Revelation in the New Testament is often referred to as the Apocalypse. The term is for this reason associated with the biblical concept of the end of days or the end times. A peculiar encounter with an apparition, typically in the form of a universally recognized personage, type, or figure. Universally recognized personages, types, figures, or symbols. A gold-overlaid wooden chest described in the book of Exodus as containing the two stone tablets Moses received from God on Mount Sinai. Also contains Aaron’s rod, a pot of manna, and, by some accounts, one of the thirteen original Torah scrolls. The Jewish scribe-scholars in the sixth and tenth centuries who refined a system of pronunciation and grammatical interpretation, inserting diacritical markings and notes in and around the biblical Hebrew text without altering the existing letter sequence. See also Masoretes. Renowned Spanish rabbi and Torah scholar (1255–1340). Refers to the three editions of the Hebrew Bible based on the Leningrad Codex and edited by Rudolf Kittel. An edition of the Masoretic text of the Hebrew Bible based on the Leningrad Codex and provided with text-critical notes. Biographical information that is interwoven into a text by various methods of precise symmetrical or mathematical encryption. The key entrusted to a high court official to access the royal treasure chambers and archives. In ancient times this key was so large it was attached to a sash and visibly carried on the shoulder of the chamberlain. It is believed that later an embroidered shoulder sash alone was worn as the outward symbol of the chamberlain’s status. A thematically mirrored literary structure. For example, “His time a moment, and a point his space” (Alexander Pope, Essay on Man). Ciphers are mechanical operations or algorithms. In and of themselves they do not communicate meaning. A cipher code would be a mechanical algorithm employed to select letters or symbols that, if formed into words, phrases, or glyphs, could express intelligent communication. Descendants of Jews who maintain some Jewish traditions of their ancestors while publicly adhering to other faiths. The science that deals with hidden, disguised, or encrypted communications, including communications security and communications intelligence. Small symbols or markings placed around letters in a text to indicate a prescribed pronunciation, accent, or emphasis. The double repeat of the Hebrew letter vav (“nail” or “peg”). Signifying the two nails used to impale the hands of Jesus Christ to the cross. Information or communication intentionally hidden or interwoven into a text or sequence of letter symbols using any number of cryptological methods. To encrypt information is to alter it by using a code or mathematical algorithm so as to make the information unintelligible to unauthorized readers. Literally “evenly spaced.” Distant by equal amounts from two or more points. One of the encryption methods employed for the purpose of compacting intelligent information into the biblical Hebrew text. An exact photographic copy of a book or manuscript. The Great Law of Peace of the Iroquois Six Nations (Oneida, Mohawk, Cayuga, Onondaga, Seneca, and Tuscarora). The oral tradition comprised both the constitution of the Iroquois Confederacy as well as their sacred history. Storage area in a Jewish synagogue or cemetery designated for the temporary storage of worn-out Hebrew-language books and papers on religious topics prior to proper cemetery burial. A mathematical field of study focused on finitely generated groups. This theory explores the connections between algebraic properties of these groups and the geometric properties of spaces on which they act. The theory views groups as geometric objects which can be explored in the same way as single geometric objects. A form of writing using picture symbols representing objects or concepts. Often difficult to decipher or read without a key or lexicon. A set of traditional symbols or forms employed primarily on thematic works of art and ceremonial and religious devices. Generally, each symbol set is expressly associated with a specific personage or ceremony. Religious icons are thus called because they incorporate one or more of these traditional symbols in their execution. An internal literary structure accessed via an equidistant key encryption that unlocks a two-dimensional array containing intelligent communication based on mathematical symmetry and thematic synchronization. Upside-down or opposite positioning, order, or arrangement of letters, symbols, words, or phrases to amplify or refine meaning. Region of central coastal Anatolia in present-day Turkey that in ancient times consisted of the northern territories of the Ionian League of Greek settlements. A general term referring to practitioners of different forms of mysticism across different eras of Jewish history. Kabbalah, which emerged in twelfth-century Europe, is the most well known, but much older traditions, such as Merkabah mysticism, are known to have been studied and practiced as early as 1000 BC. The ancient Jewish tradition of the mystical interpretation of the Bible, first transmitted orally and using esoteric methods (including ciphers). It reached the height of its influence in the later Middle Ages. A member of a Jewish sect founded in the eighth century and located chiefly in Crimea and nearby areas, as well as in Israel, which rejects rabbinical interpretation in favor of a literal interpretation of the Scriptures. As used in this book, a key code is an equidistant linear encrypted word, name, date, or phrase found in the open text of the Hebrew Bible that can be empirically demonstrated to have been intentionally designed into the text from which a two-dimensional array can be formed based on its equidistance. 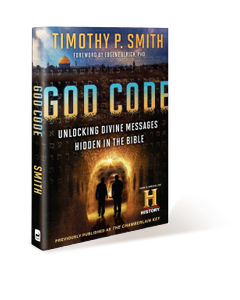 As used in this book, the key code refers to the full, complex encryption compacted into Genesis 30 in the Leningrad Codex that demonstrates the various systems of encryption as well as the thematic focus of the subtext. The technical and contextual information detected from this prime or key code enabled the unlocking of additional information in other sections of the text. The study of the tradition of the veneration of Mary, the mother of Jesus Christ, as relates to her many symbolic or literal attributes, especially in her role as the literal mother of God and her symbolic representation as the ark of the covenant holding and protecting the Word of God. Jewish scholars of the sixth through tenth centuries AD who established a recognized text of the Hebrew Bible and imposed an interpretive system of pronunciation and grammar by positioning diacritical markings next to the original consonant letter sequence of the text as well as adding interpretive side notes and commentary. A two-dimensional array in the visual form similar to a checkerboard or crossword puzzle. A two-dimensional array placed or imposed on the visual surface of any medium or object, serving the function of a grid where letters, numbers, or symbols can be positioned based on various meaningful juxtapositional relationships. Rabbinic literature that contains various forms of commentary, including exegesis of Torah texts, stories, and sermons, which usually form a running commentary on specific passages in the Hebrew Bible. Primary purpose is to resolve matters of difficult interpretation. Literally “writing in reverse order.” Easily deciphered by using a mirror. An object or device (often sacred or ceremonial) used or displayed to prompt one’s memory. Often incorporating symbolic and iconographical elements. Any letter, glyph, or symbol that has an established number value. Literally “five scrolls.” The first five books of the Hebrew Bible (Genesis, Exodus, Leviticus, Numbers, and Deuteronomy). To be aware of an event before it takes place in linear or physical time. The oldest and leading fraternal brotherhood responsible for the preservation of the tradition, pilgrimage, and veneration of the Rocío Madonna. Their private headquarters, museum, and archive are in Almonte, Andalusia, Spain. A document retained and preserved in a secure repository against which copies or transcriptions can be checked for accuracy and authenticity. A type of matrix barcode that is a machine-readable optical label containing information about the item to which it is attached. Literally “a carrying off.” The Hebrew word shalhoub (<~?~Typesetter, insert the Hebrew for Shalhoub>; “rapture”) is imbedded by equidistant skip in the phrase on the third day whenever that phrase is used in the Leningrad Codex. Religious symbolism often represented in multifaceted artistic forms employed to convey religious concepts and events. Ostensibly, a small carved wooden statue of the Virgin of Rocío venerated in the Hermitage of El Rocío in Andalusia, Spain. More broadly referring to the nearly eight-hundred-year tradition associated with a miraculous apparition of the Lady of the Dew to a hunter near the village of Almonte, Spain, sometime in the early Middle Ages. A small, often brittle segment of a larger scroll. Ancient biblical scrolls are often unearthed in a fragmented condition requiring extensive conservation and reconstruction. A meticulously handwritten copy of the Torah transcribed under extremely strict standards. Used in the ritual of Torah reading during Jewish prayers. A third-century BC translation of the Hebrew Bible and some related texts into Koine Greek. Sometimes referred to as the Greek Old Testament. One of the primary source texts for modern Bible translations. The simultaneous occurrence of events or observations that appear significantly related but have no apparent causal connection. Often related to supernatural or miraculous events. The Hebrew Bible or canonical collection of Jewish texts. It is the source text for the Christian Old Testament and is composed mainly in biblical Hebrew, with some passages in biblical Aramaic. The Masoretic text as preserved in the Leningrad Codex is the officially accepted version of the Hebrew Tanakh. The harmonization or interweaving of thematic details, concepts, events, and accounts in the open text of the Hebrew Bible with corresponding or complementary encrypted information. A lock fitted with a device that prevents it from being unlocked until a set time. A code or cipher that cannot be decrypted until a predetermined time when external future events synchronize with internal characteristics of the mechanism or coded text. An ornamental closet, usually positioned in the front center niche of a synagogue, used to store, protect, and honor the Torah scrolls. When some Jewish communities in Europe were compelled to convert their synagogues into Catholic churches during the Inquisition, they replaced the Torah ark with a statue of the Virgin Mary to represent the ark or physical vessel of the Word of God. A written or printed representation or copy of a manuscript or text. Elijah ben Solomon Zalman (April 23, 1720–October 9, 1797), Talmud scholar and prominent leader of non-Hasidic Jewry in the eighteenth century.